For centuries, Master Tung’s Points have been obscure and inaccessible to most practitioners. Now, for the first time, Tung’s Points are available for any acupuncturist to learn and practice—thanks to Dr. Wei-Chieh Young's books and Susan Johnson's DVDs. Whether you’re a new or seasoned practitioner, whether you’ve already studied Tung’s Points or not, these resources will provide a set of easy-to-use, highly effective tools for your clinic. Beginning practitioners will be able to build their practice on the incredible results they get with Tung’s Points; more experienced acupuncturists can refine their skills and deepen their understanding of the rich complexities of Master Tung’s acupuncture. Discover a remarkably effective, easy-to-learn system of acupuncture with immediate and lasting results. This 4 DVD series features more than 60 movies of high-quality, close-up digital footage from Susan Johnson's courses, demonstrating point location and technique for the most powerful point combinations in Master Tung's acupuncture. With her characteristic clarity and precision, Susan teaches this simple but potent system, sharing methods she’s perfected in more than 25 years as an acupuncturist and instructor. Watching this DVD series is like attending the demonstration portion of Susan’s seminars—and as her students know, she packs every demo with a wealth of essential information. With extremely detailed explanation and visual cues, Susan makes point location easy and fun. The DVDs are easy to watch on a computer or TV, with user-friendly navigation and a chapter for each point combination. This is an irreplaceable companion for the Master Tung’s acupuncture books. The series also includes bonus demos of special procedures, including a unique and potent application of moxa. "The time Susan spent detailing her observations and subtleties of each point/technique is worth a million dollars. Susan is superb at communicating practical information. The extraordinary results that I am seeing in my practice by utilizing Master Tung's theories & techniques are what I always believed I would be able to expect as an acupuncturist." and expertise with the personal characteristics of compassion and generosity of spirit. I was inspired and am very grateful for the opportunity to study with her." "The Correct Tendons points have helped many of my patients with chronic reoccurring headaches related to whiplash they experienced two, four, and twenty years earlier. Susan Johnson is one of the greatest teachers who goes the extra mile to make sure her students are really well prepared to apply her teaching techniques." "I have learned so much. Susan Johnson's classes have given me more tools and more confidence. I am getting wonderful results with Heart Gate. I had two patients with groin pain—they think I am a miracle worker! Patients are also amazed at the speed of improvement—fewer treatments!" Would you like to resolve TMJ with just one treatment? Release a 30-year-old whiplash? Clear a painful hip joint? These are the kinds of results you can expect when practicing the art of cupping. An ancient and multicultural technique, cupping draws toxin buildup or muscle spasm out of the deep tissues of the body, while simultaneously pulling in freshly oxygenated blood. In cases of blockage or stagnation, the correct use of cupping can reduce a patient’s healing time by weeks and even months. And you can obtain amazing clinical results with treatments of just 10 minutes. This 8-DVD series masterfully presents the art of cupping in high-quality, close-up digital footage from Susan Johnson’s courses. In a dynamic and accessible style, Susan shares all the information a practitioner could ever need about this indispensable method. Full-length video demonstrations with clear explanations of the cupping process. Lectures—illustrated with video footage of cupping offering hundreds of minute details and experiential gems from Susan's extensive experience as an acupuncturist. Precise instruction in when, where, how, and why to use cupping, and the various cupping styles (plastic pump up, glass flame, running/pulling, and bamboo). Printable versions of ten different cupping patterns for treating a wide range of structural issues. 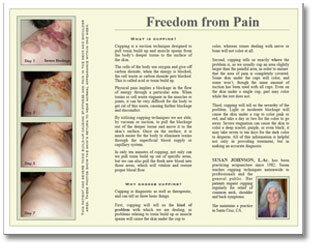 Printable full-color brochure for patients, with answers to questions like: “What Is Cupping?,” “Why Choose Cupping?,” and “Is Cupping Painful?,” along with instructions for aftercare; includes color photos to illustrate cupping marks as they change color over a 7-day period. User-friendly navigation, with detailed markers for finding and viewing specific video clips. Although it’s widely used in many other cultures, cupping is under-utilized in the United States due to limited understanding about its powerful effects. This new educational resource makes it easy and fun to thoroughly understand and comfortably practice the incredible art of cupping.